Combine teriyaki sauce, ginger, garlic, lemon zest and lemon juice in a small bowl. Preheat oven to 400 and spray cookie sheet with cooking spray. Spread 1/2 glaze over the salmon and bake 15 – 20 minutes until salmon just flakes. Do not over-cook or salmon will be dry. Heat olive oil in non-stick pan over medium heat. Saute broccoli for 6 – 8 minutes until crisp tender, adding chicken broth as needed to keep from burning. Add remaining glaze to broccoli and cook another minute to heat through. I can’t say I’m not sorry to see things getting back to normal after all the holiday fun, or what passes as normal in my house. Healthy eating feels good too. All the cookies and treats are gone, and the dining out and dinner parties over for awhile. Salmon is on our dinner menu at least once during the week. 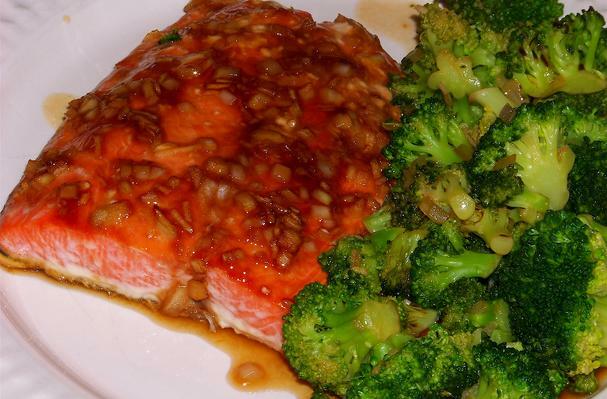 This salmon is roasted in the oven, glazed with bottled teriyaki sauce dressed up with fresh ginger and onions. I used the same sauce to stir fry the broccoli for a colorful veggie on the side. Healthy and delicious. Can’t beat that!